Home / Technology / What is the Suitable Distance to Watch Laser TV? Many people are very puzzled about TV viewing distance and don’t know much about it. Experts’ opinions differ greatly from the actual experience. So how much is it? Watching distance actually needs to be described from four aspects, one missing is one-sided. The following is a 100 inch laser TV as an example to illustrate the analysis process. The following picture is the generally viewing distance for most of watching scenario. When we look at the screen which is not a piece of iron. It’s actually a lot of particle pixels. The clearer the screen is, the more dense the pixels are. This is what we often see as 720p, 1080p and 4K. When viewing, you can’t see pixels on the screen, otherwise the viewing experience is very poor. First, do not talk about the problem of film source, just say the TV screen resolution, 1080p is 1920*1080, 4K is 3840*2160, 4K pixel density is two times that of 1080p. From this perspective, the viewing distance of 4K is half of that of 1080P. But we can’t always watch the 4K movies, after all, they are not popular enough. This distance is much shorter than our usual habit data, and we usually think it must exceed 4m. In fact, 3.0m is the shortest distance, and there will be no problems a little more than it. But it must not be less than 3.0m, otherwise you can see the pixels on the screen, which is absolutely unacceptable!! If we go back to 720p, after all, this is the mainstream of live HDTV. How much is the distance of 100 inch TV? See, this is the best recommended distance given on many networks or experts now, in fact it is based on the resolution of the source, and now the TV screen is all over 1080p. Choose what kind of viewing distance to see what program source you see. The experts recommended solely on TV screens are actually pseudo experts. Under the same conditions, of course, it is better to have a shorter distance and a stronger sense of immersion. Lucas THX is the third party certification body of professional view, one of the most authoritative international institutions, similar to the sound industry of Dolby, they give the best is to compare the limit, we can generally add some allowance, and not strictly based on the size of the design of their own home view distance, to see the individual differences. Is it true that watching 4K movies really makes 1.5m distance? This is to talk about other conditions. Watching a 100 inch TV the viewing distance can’t be shorter than 1.52m. On the Internet, there was a sharp 70 inch TV with 8K resolution, claimed that the viewing distance was 0.68m, which was unscientific, 1.52*0.7=1.1m. It is not simply to separate the 4K viewing distance from 2. Now, let’s talk about the last factor, radiation. More short distance, the radiation must be larger. How much is suitable? The child’s parents or pregnant women are particularly concerned. Early CRT television, mainly electromagnetic radiation, while the liquid crystal LED and other alternatives, electromagnetic radiation has been very small, the electromagnetic radiation of liquid crystal TV has no large than mobile phone. We don’t talk about early CRT TV. Theoretically, any circuit will generate electromagnetic radiation and increase with the increase of power. The metal body is a very good radiation shield, so now the brand LCD TV, part of the circuit has a metal shield. According to the current general test, the radiation distance of LCD TV is about 2m, and is also relatively weak, about 0.1 μT. The radiative evaluation report shows that the liquid crystal TV, whether it is half a meter or 3 meters in the front, the test results of the opening moment, the normal viewing, the changing platform and the standby state are 0.1 μT, while the side is only 0.11 μT, basically the radiation intensity is not changed. Regulations for electromagnetic radiation protection: in the living environment, the power density of electromagnetic radiation IS NOT more than 40uW/cm2 (the equivalent of about 4 milli Gauss, 0.4μT). From the above data, only the radiation of LCD TV is about the 1/4 of the standard. The radiation standard of the mobile phone is called SAR, that is, the absorption power is not exactly the same as the direct radiation value of the TV, the national standard of the United States is lower than 1.6W / kg, but this can not be converted into a radiation unit directly. Household appliances, electromagnetic wave, microwave ovens, vacuum cleaners, mobile phone radiation is strongest, can reach 200MG (approximately 2000 MW), namely 20μT. Thus, electromagnetic radiation of mobile phone is 200 times than LCD TV (mobile phone in call switch, low signal, the strongest radiation)! So don’t worry about electromagnetic radiation of LCD or laser tv. The power of the laser TV is lower than that of the LCD TV of the same size, so the radiation is also smaller. For example, 100 inch, the power of LCD TV is about 1400W, and laser TV is generally only 200 to 300W, the gap is obvious. Then the rest is the light of TV. Too strong and too weak light will cause visual fatigue, which will damage your eyes for a long time. First of all, We would like to explain a few concepts. Is the brightness of the screen called lumen? In fact, lumen is the total intensity of light. It needs to be divided into area per unit of light and unit LUX. The projector is the best example. The same lumen number, the projection area is large, and the brightness is down. 1Lux = 1 lumens / 1m2. People are suitable for 300 to 750lux light environment. Take 2000 ansi lumen 100 inch laser TV as an example. So what’s the average LCD TV? In terms of parameters, the brightness of the LCD TV is generally 500CD / m2, that is, 500nit, which is 2.7 times brighter than that of 2000ansi lumen laser TV, in other words, the LCD TV is too bright, and it needs to be reduced to less than 50%. But the brightness can not be too low, too low will cause the screen to be dark, the details can not be seen clearly, it will hurt the eyes. In the brightness parameter, the laser TV has a great advantage. Diffuse light not only protects the eye, but also has a good brightness, and the color and details are very clear. The simplest example, the sun is direct light, like a liquid crystal TV, the moon is diffuse light, just like the laser TV, we can watch the moon directly, but watch the sun is almost fatal. The example is extreme, but the truth is the same. Perhaps compared to LCD TV, eye protection is the biggest advantage of laser TV. 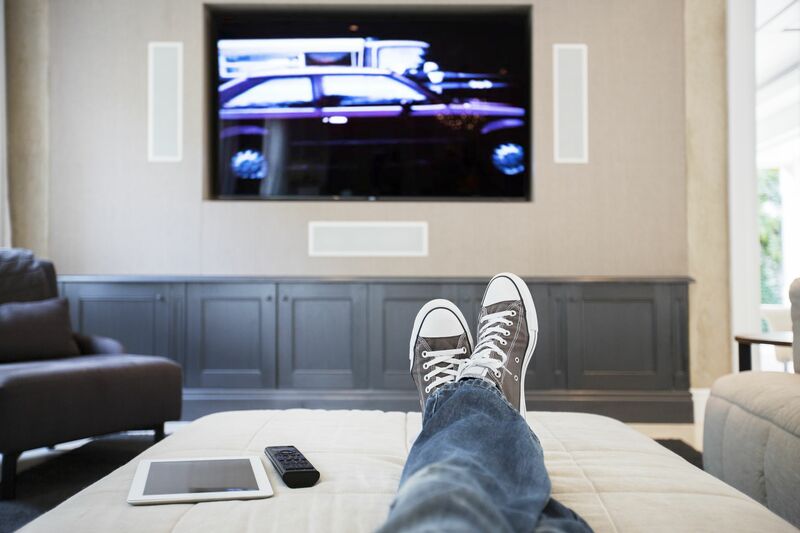 One conclusion is that if the front viewing distance is satisfied, the radiation of the laser TV can be neglected, whether electromagnetic radiation or light radiation. Look at 4K, 1.52m. This is the shortest distance. In fact, we usually recommend 3m to watch the movie from the distance, the most immersive, and the head and eyes are also more comfortable. Next post: Does Laser TV hurt Eyes?